Slovenia is counting down the days until the birth of a new generation of "baby dragons." POSTOJNA, Slovenia (AP) — Slovenia is counting down the days until the birth of a new generation of "baby dragons." 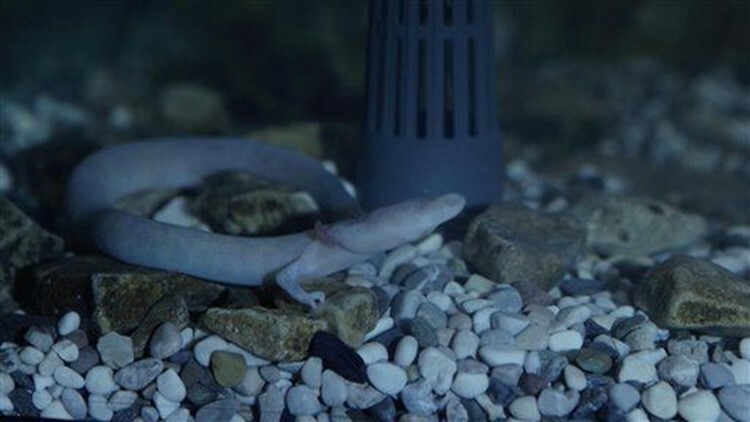 Scientists in the Central European country have proudly announced that a female olm — a Gollum-like, lizard-sized amphibian living in an aquarium in the country's biggest cave — has laid eggs. They have described it as the first example of observed out-of-lab breeding of the species. The eyeless pink animal, known as the "baby dragon" and "human fish" for its skin-like color, can live a century and breeds only once a decade — usually in laboratories throughout Europe or deep in caves away from people. Slovenian scientists have been ecstatic about the prospects of having baby olms born in Postojna Cave. The eggs are expected to hatch in about 100 days, or sometime in June. "This is something truly extraordinary," said biologist Saso Weldt, who works at the cave in northwestern Slovenia. "Nobody has ever witnessed (their) reproduction in nature. We even haven't seen an animal younger than two years." The olm was already in a big aquarium in the cave when the eggs were discovered by chance on Jan. 30 by a tour guide who noticed a little white dot attached to the fish tank's wall. A pregnant olm stood guard next to it, snapping at an intruder who tried to come close. Scientists removed other inhabitants from the aquarium, leaving the mother alone with the eggs. In the weeks that followed, the olm laid a total of 57 eggs, three of which seem to be developing. Biologists say this is a good number, as olm eggs have a poor record in actually lasting the 120 days that are needed for them to mature and hatch. "Olms are not really successful when it comes to reproduction," Weldt explained. Two years ago, a Postojna olm also laid eggs, but they fell prey to other cave inhabitants. So, this time biologists have isolated the female and her eggs in a dark spot, added extra oxygen and removed any outside influences. A record number of visitors in February have been allowed nowhere near the mother and her eggs — tourists could only view a live video screening via special infrared cameras that were installed near the aquarium. Slovenians, some of whom are contemplating declaring the olm the next "Slovenian of the Year," have been keeping their fingers crossed. "We did all that is in our power," biologist Weldt said. "Now we wait."